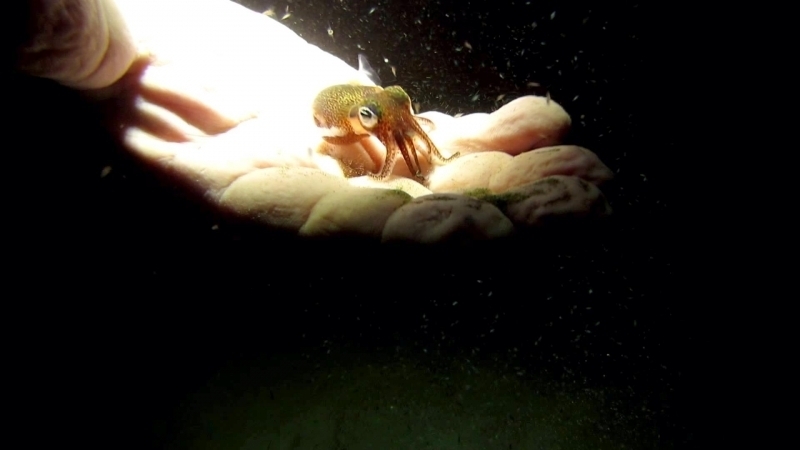 If you were swimming in the dark ocean, wouldn’t it be nice to have a flashlight? 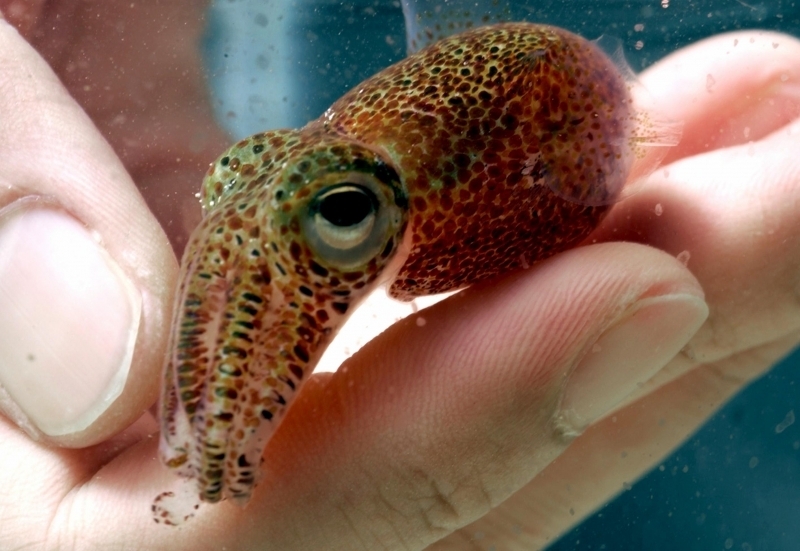 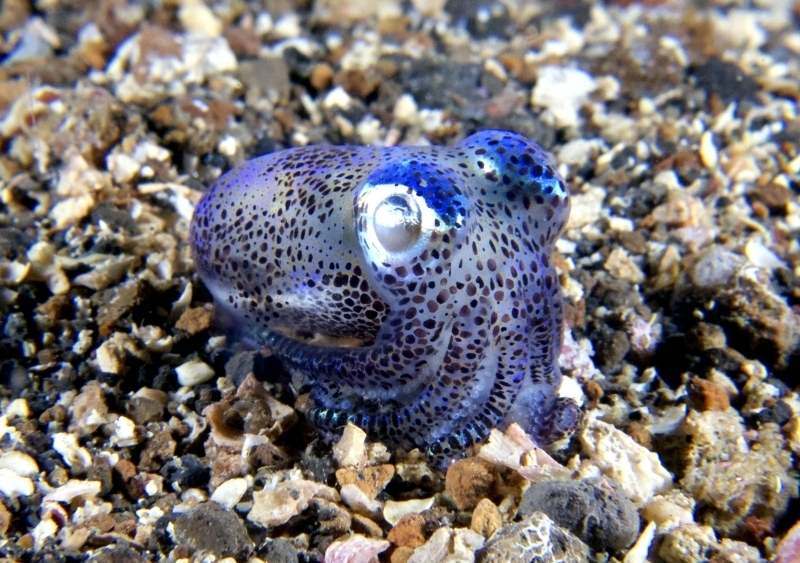 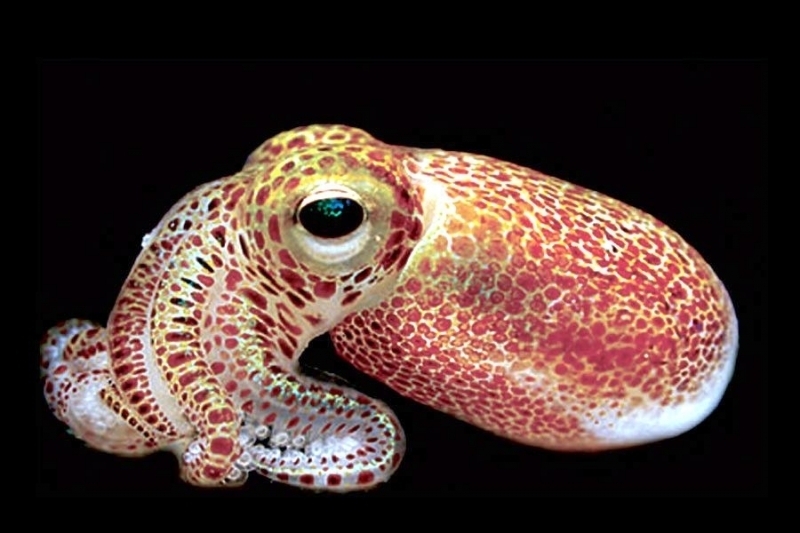 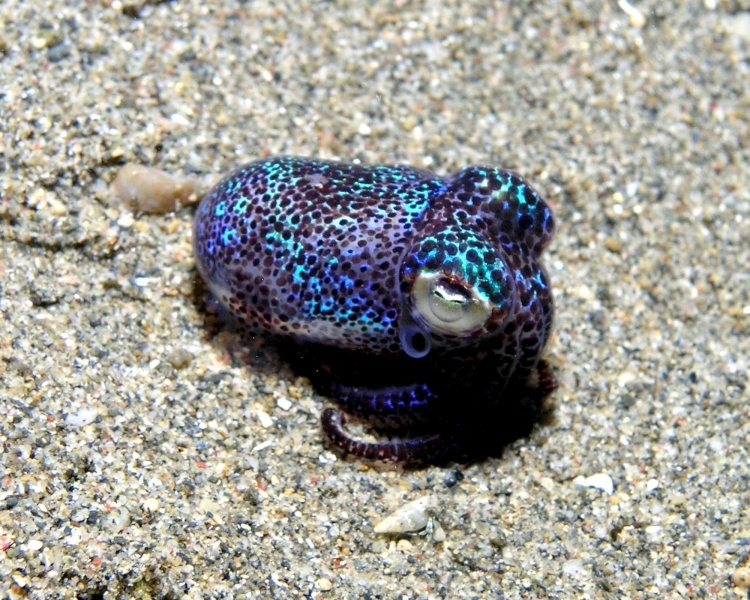 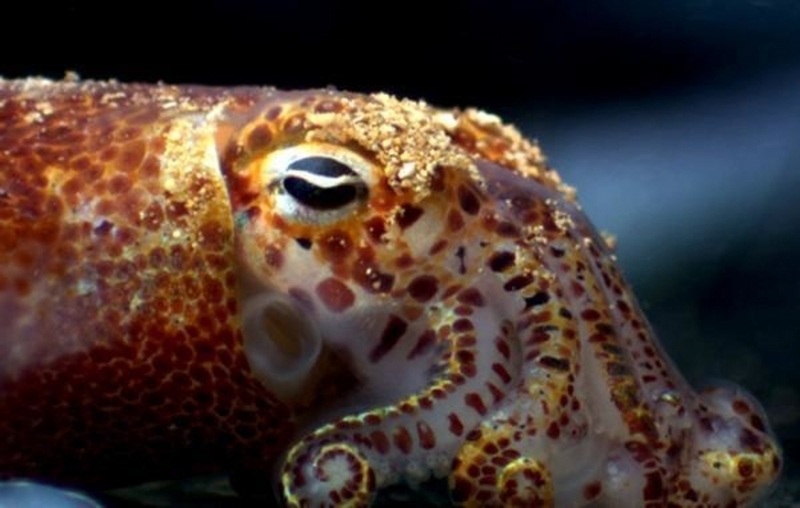 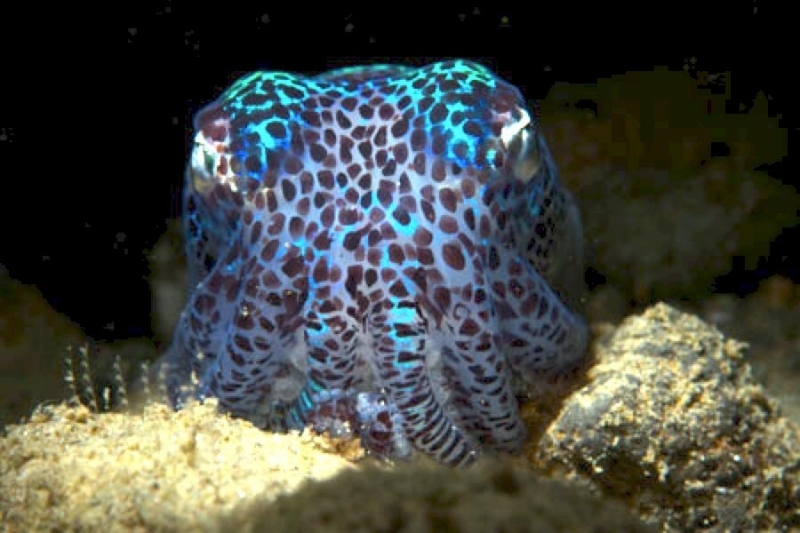 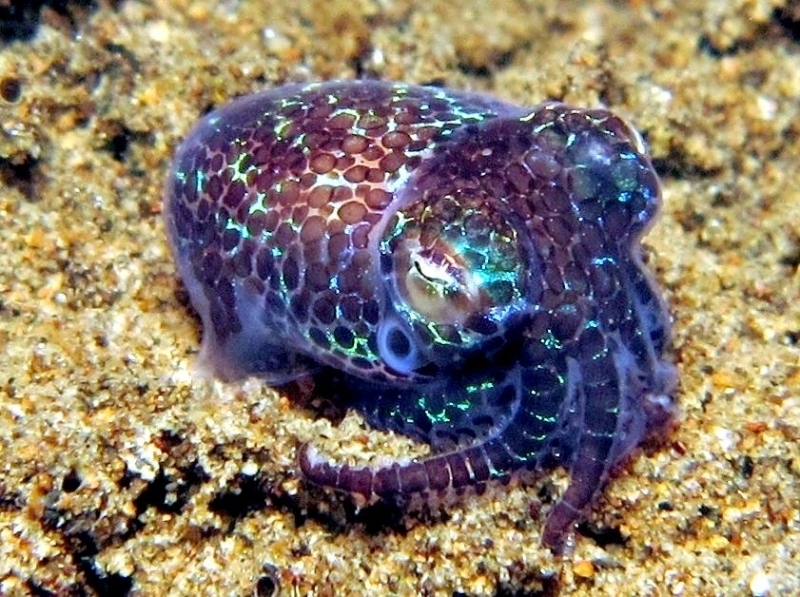 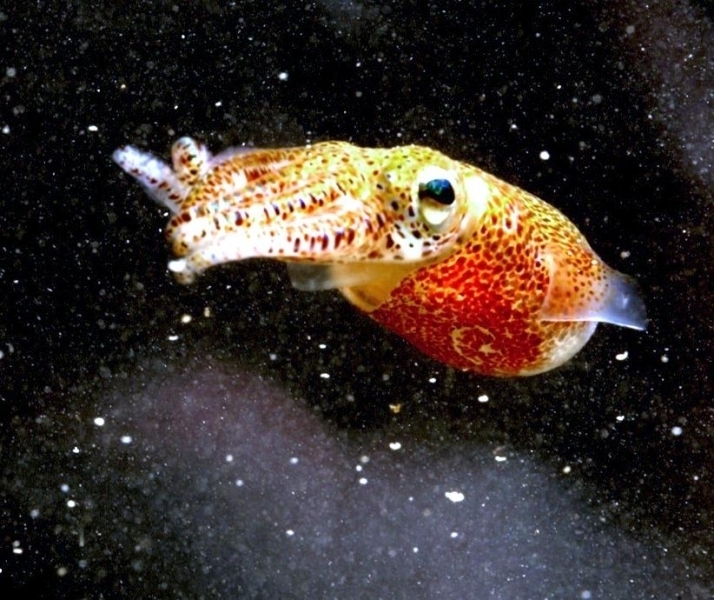 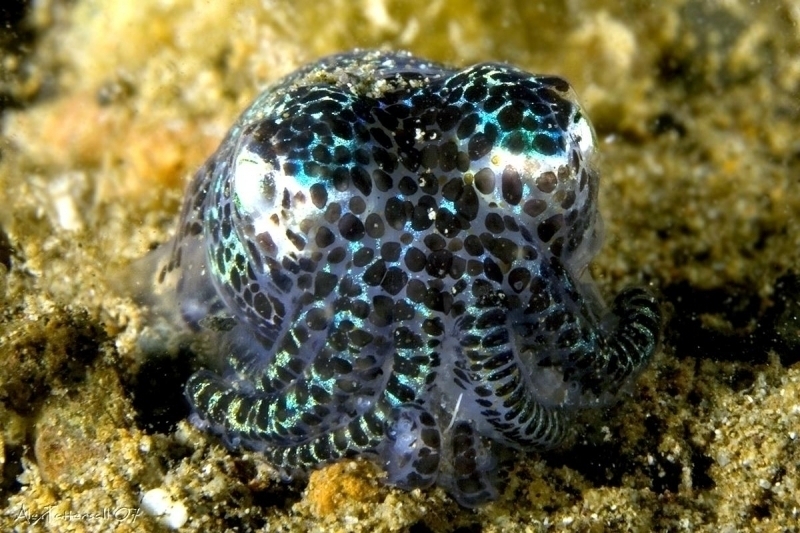 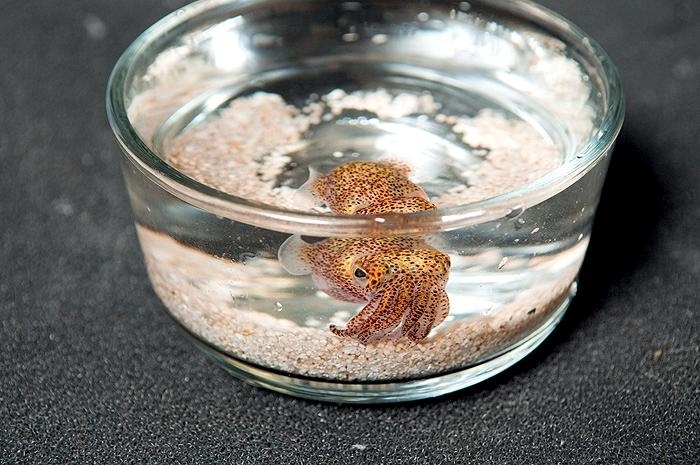 The Hawaiian Bobtail Squid has one! 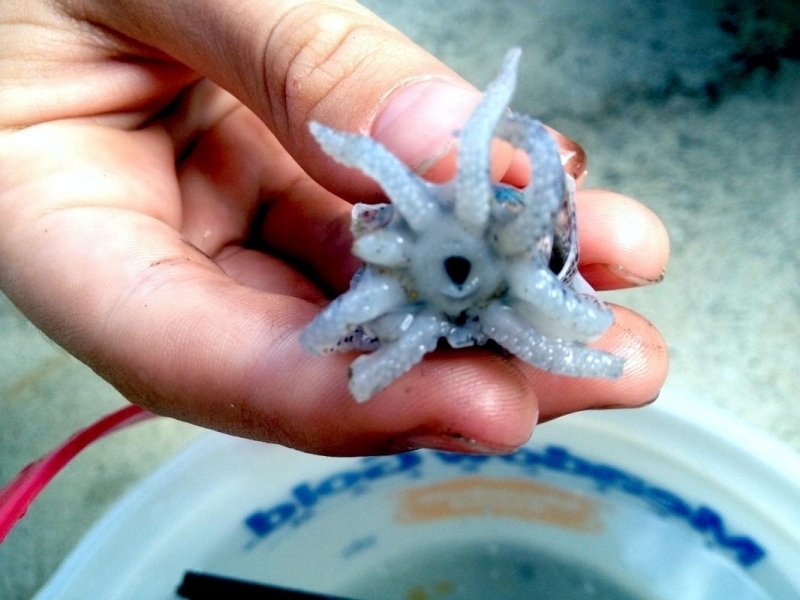 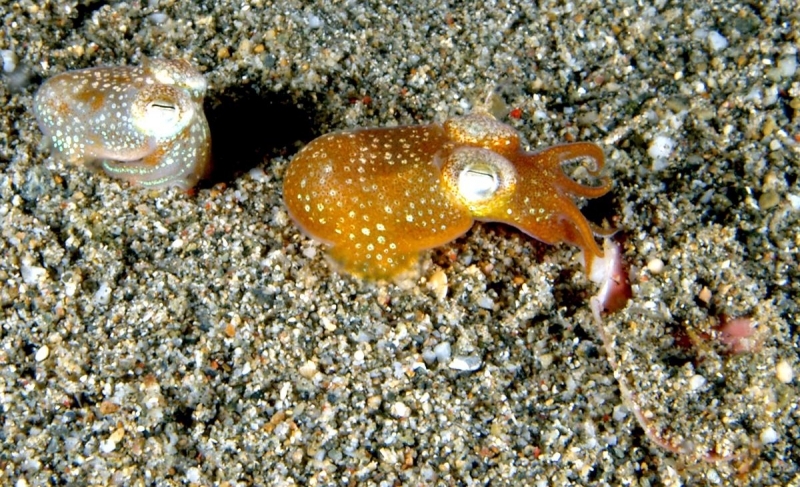 The flashlight is built right into the squid’s body and is known as the “light organ”. 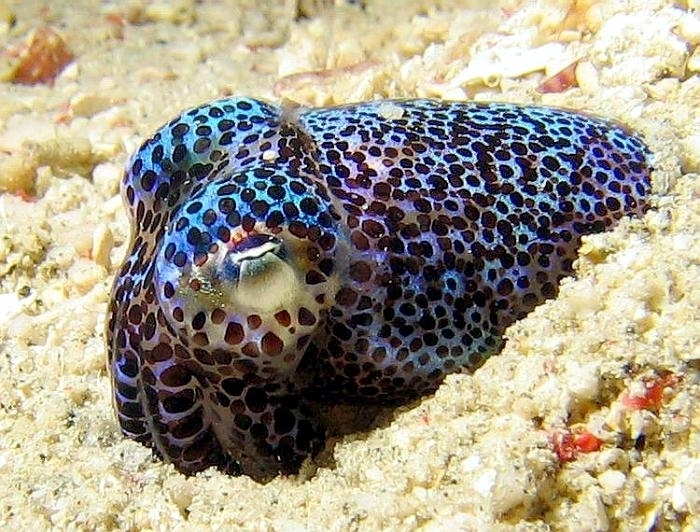 The Hawaiian Bobtail Squid usually about 2 inches long and is a cephalopod that lives in the shallow waters around the Hawaiian Islands. 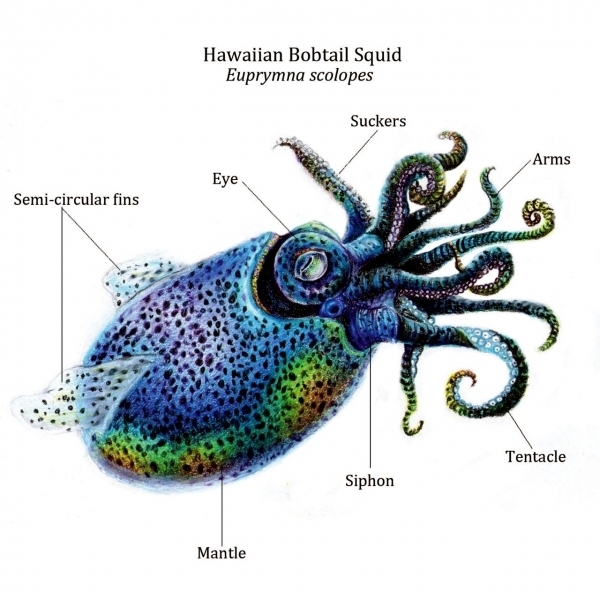 The Hawaiian Bobtail Squid is mostly brown, with some iridescent green & blue spots and has 8 arms as well as 2 longer tentacles. 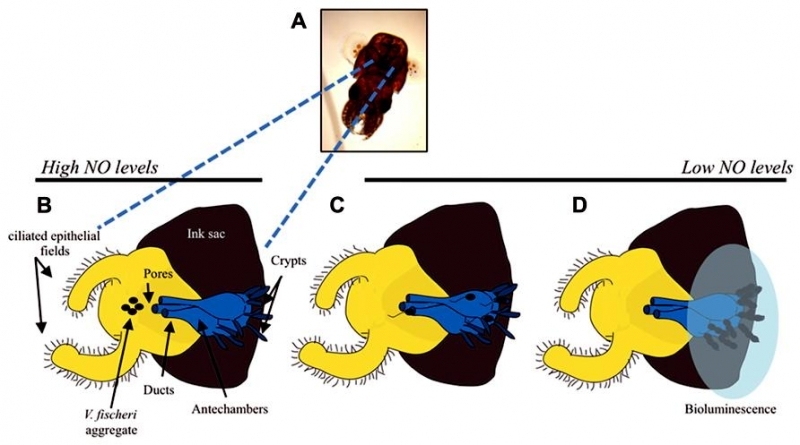 Bioluminescent bacteria which produce light, live in a specialized body cavity. 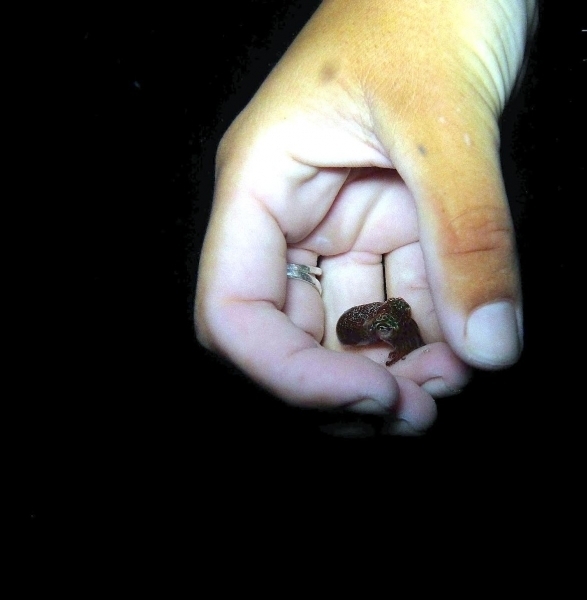 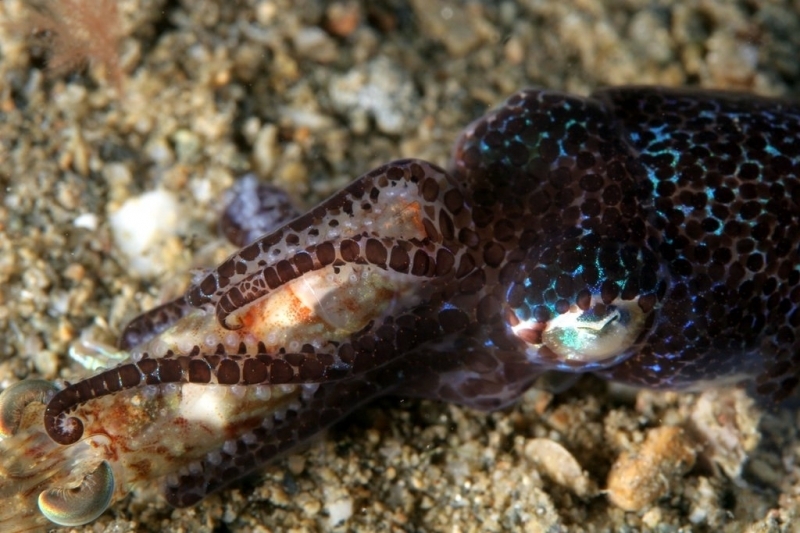 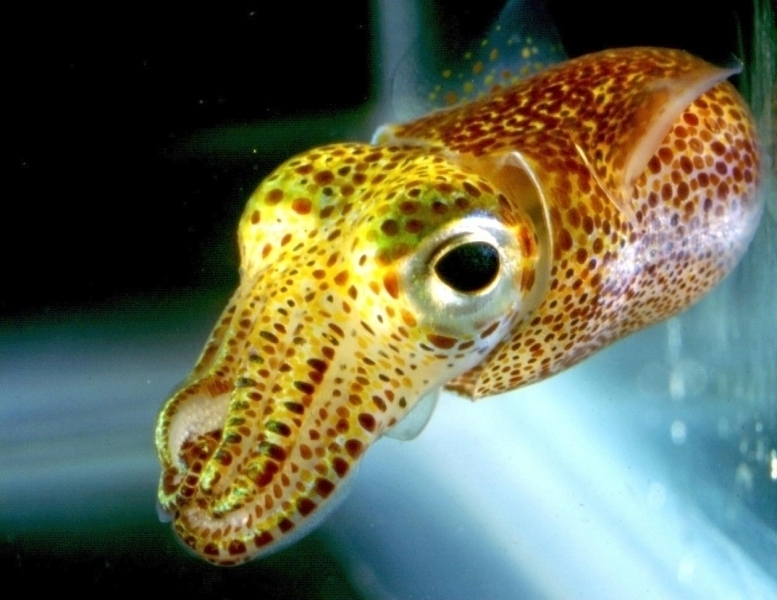 Bioluminescence occurs in the ocean in a variety of ways and in the Hawaiian Bobtail Squid, bioluminescent bacteria function like a flashlight built into the squid’s body. 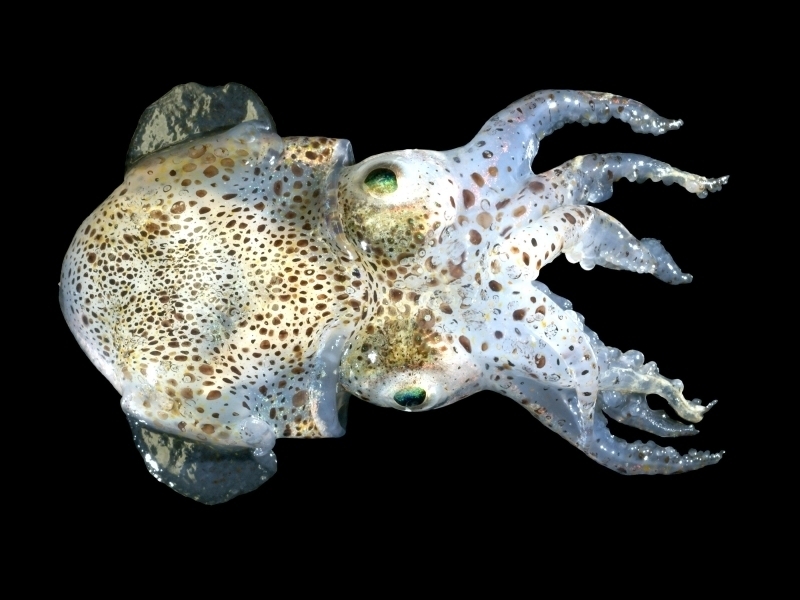 The specialized cavity in the squid’s body where the bioluminescent bacteria live is known as the light organ and it is located on the squid’s underside. 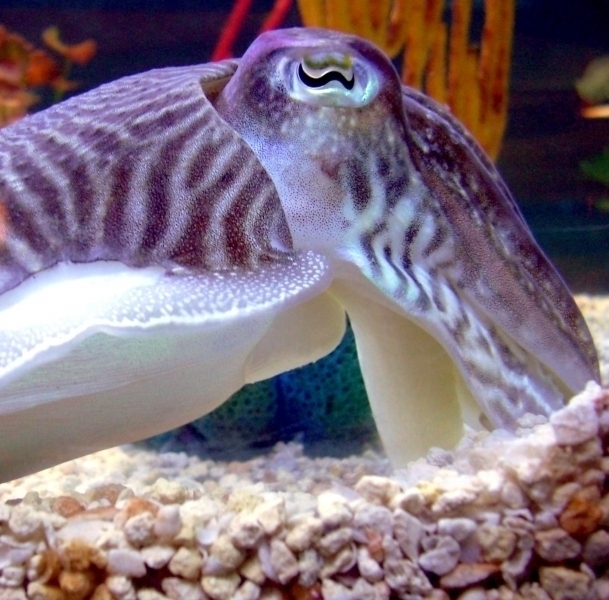 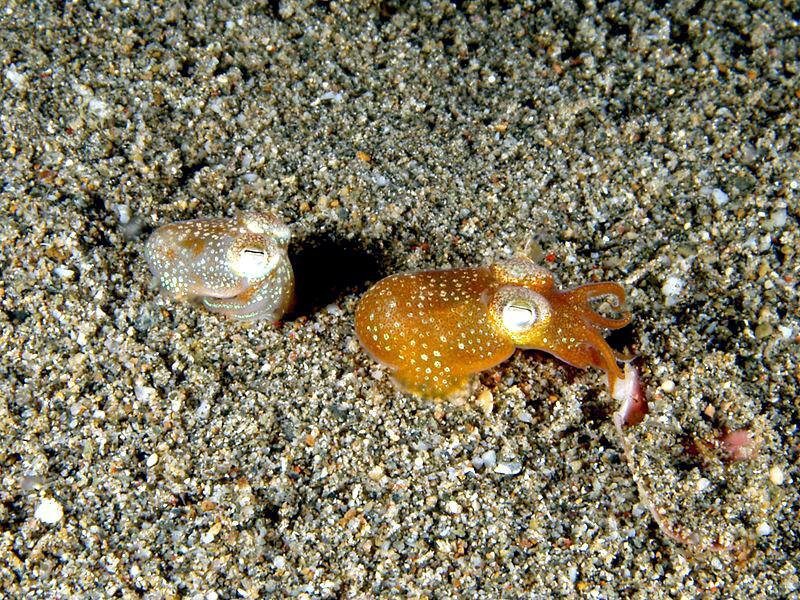 The squid & bacteria both benefit from their partnership which is called a “symbiotic” relationship. 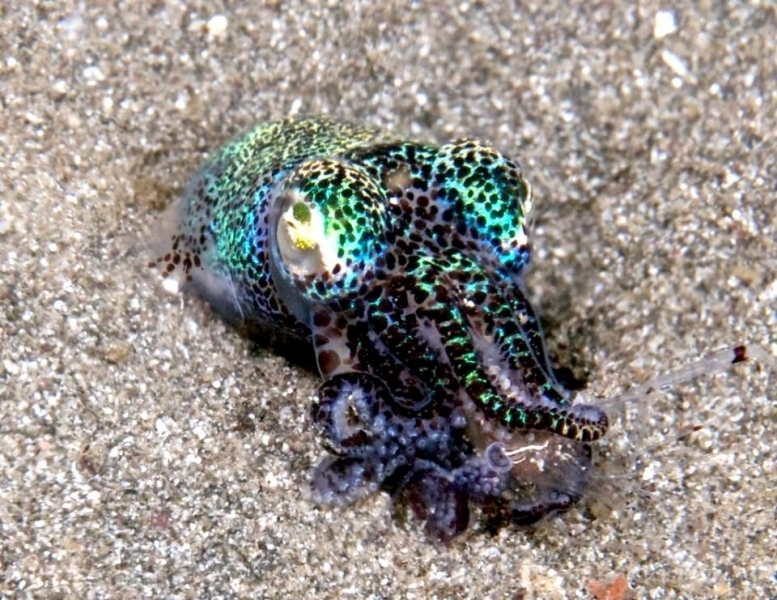 The bioluminescent bacteria get a good place to live from the Hawaiian Bobtail Squid as well as essential amino acids and other nutrients, while using its bacteria’s light to provide camouflage that helps it move & hunt at night without being detected by predators. 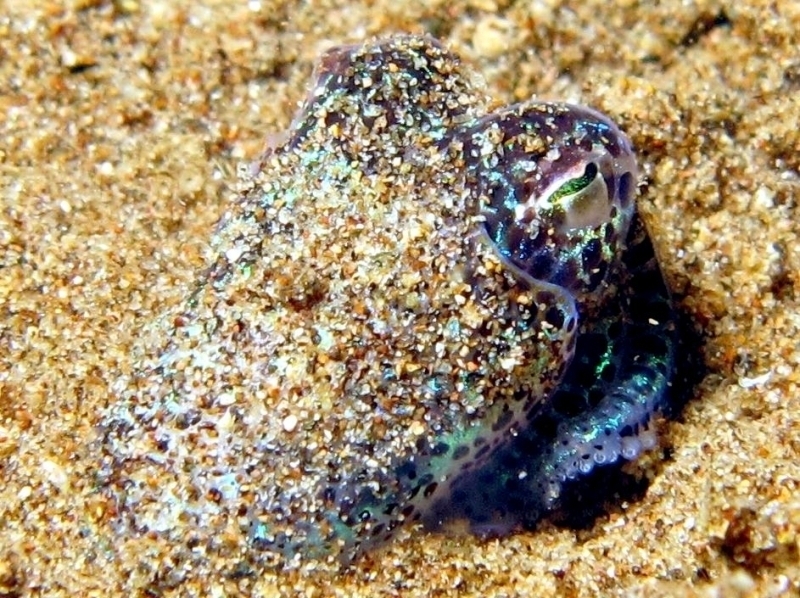 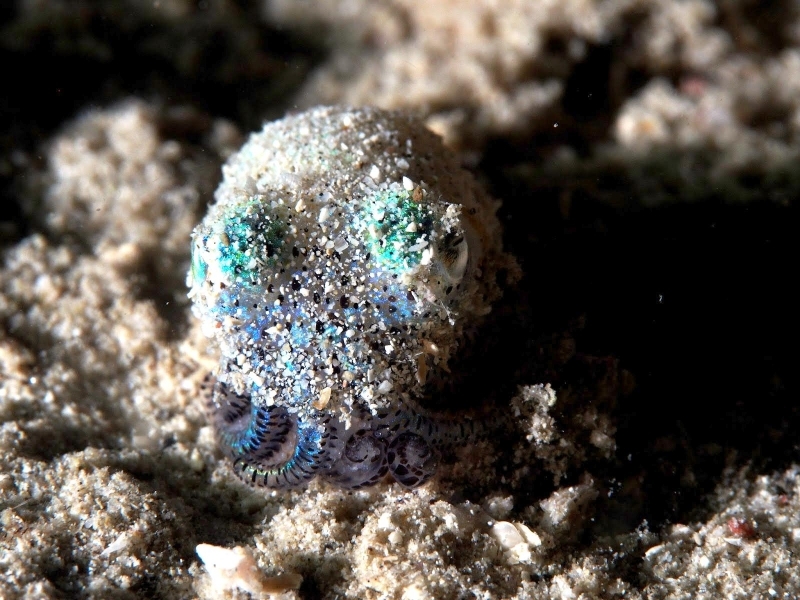 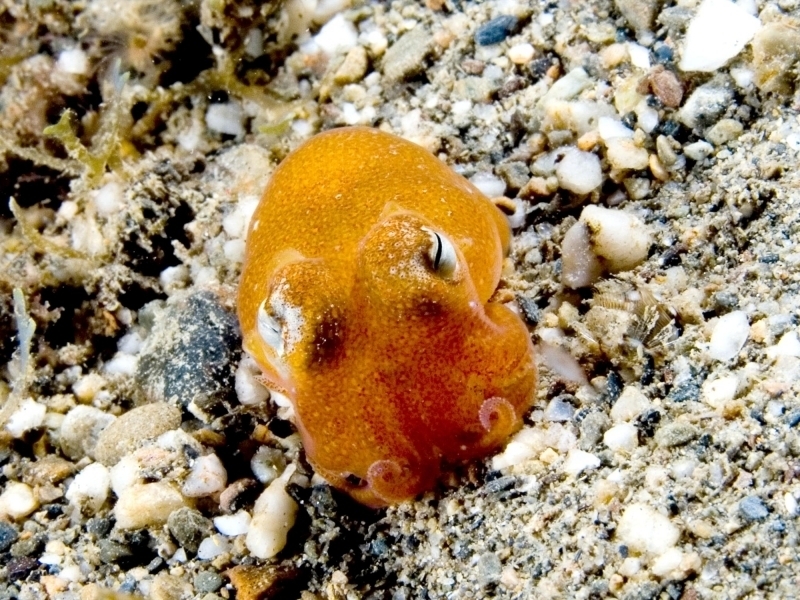 During the day, the Hawaiian Bobtail Squid buries itself in the sand in shallow coastal waters. 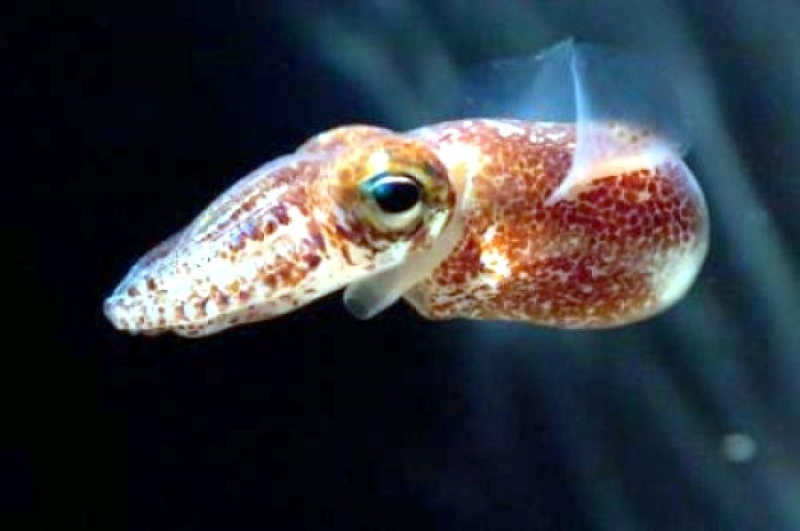 Then at night, the squid comes out to hunt for food. 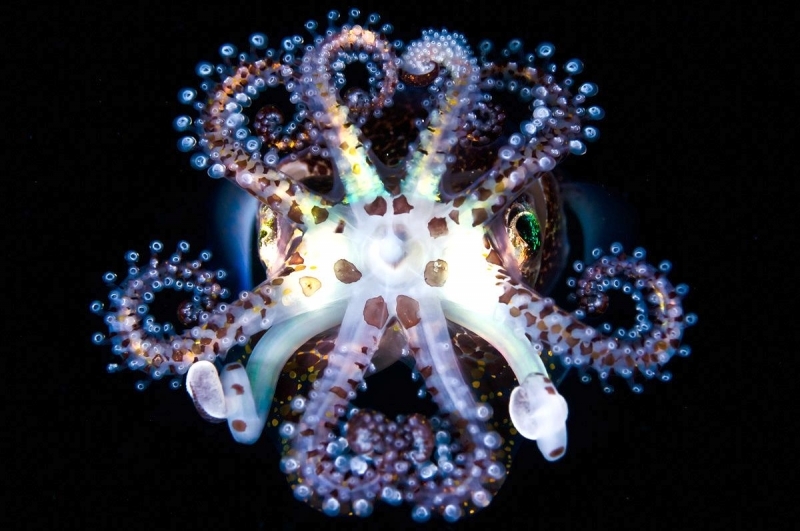 It points its light organ downward as it hunts, emitting light toward the seafloor to conceal any shadow that might be caused by the starlight or moonlight coming down from the surface. 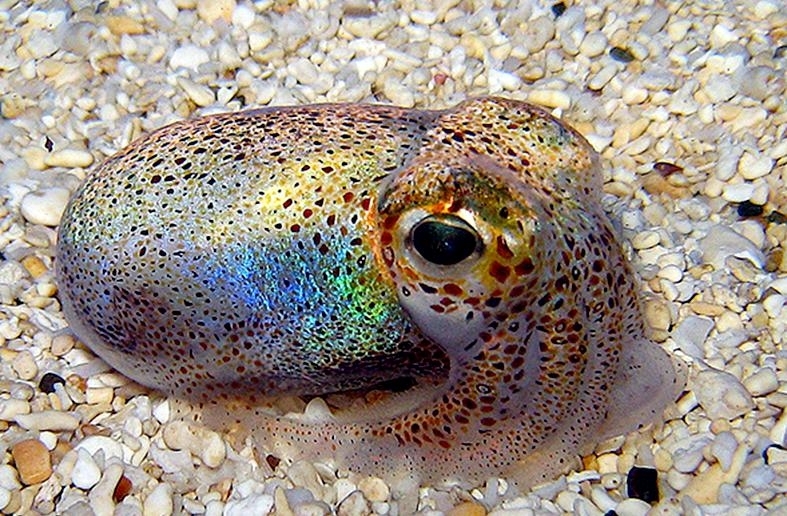 The Hawaiian Bobtail Squid senses how much light is needed and then dims or brightens the light produced by the bioluminescent bacteria by controlling the amount of oxygen that goes into its light organ. 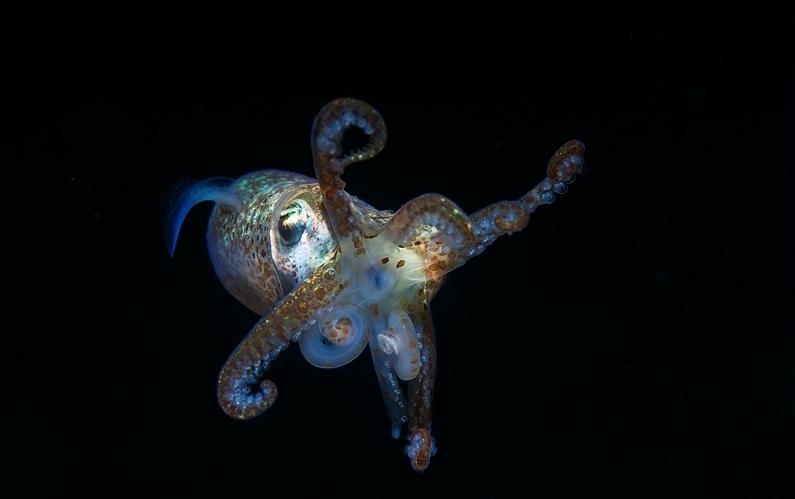 The glow-in-the-dark bacteria manufacture luciferase, an enzyme that facilitates a biochemical reaction that produces light. 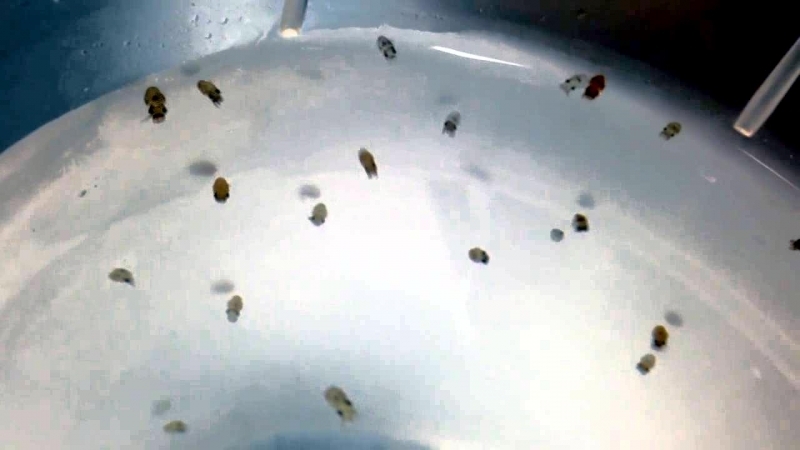 The bacteria only glows when a critical concentration of luciferase is reached and this is dependent upon the amount of oxygen available. 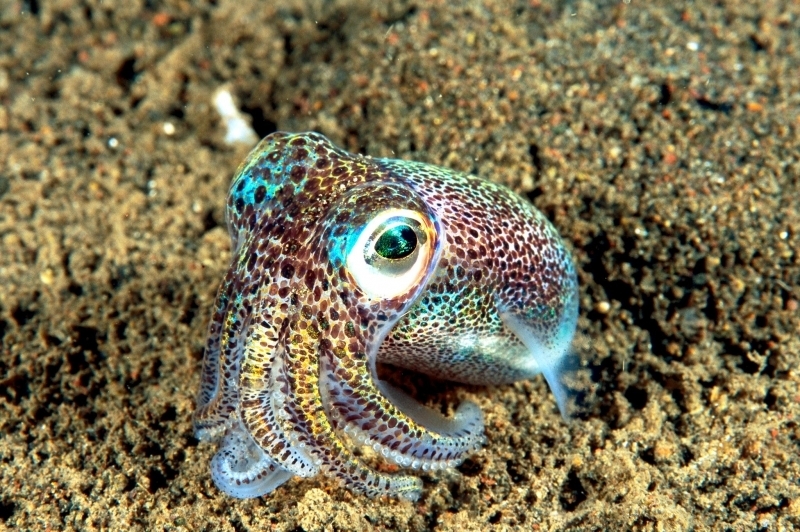 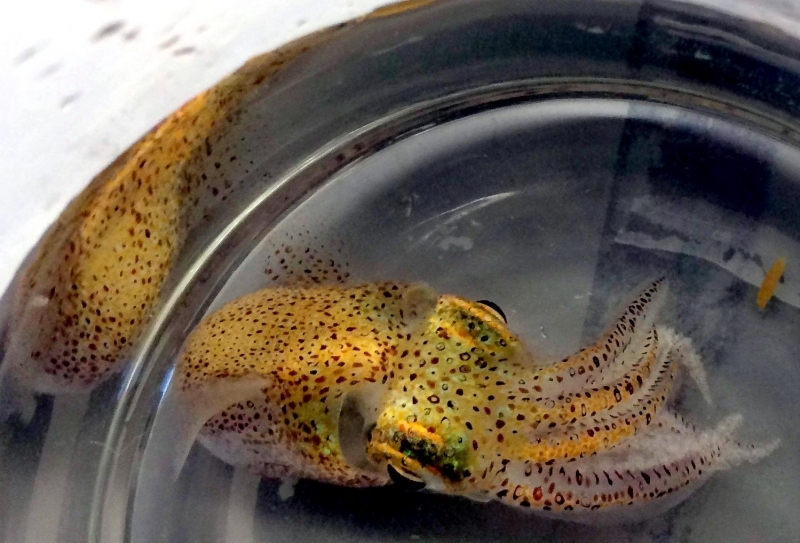 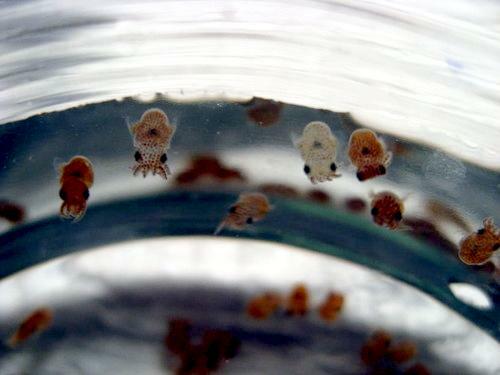 Every morning, the Hawaiian Bobtail Squid expels more than 90% of all the bacteria in its light organ back into the ocean and then new bacteria moves in. 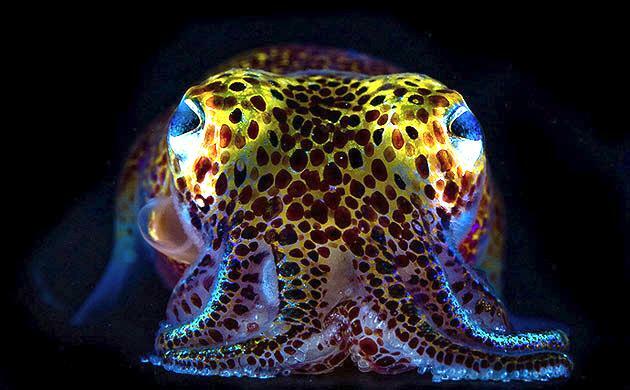 The bacteria multiply during the day and then begins glowing again by nightfall when the next hunt begins.